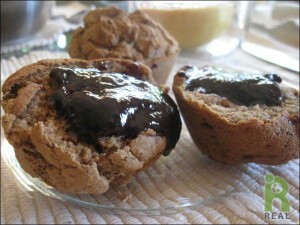 Our REAL Prune Butter seems to go with everything especially these gluten-free muffins made with REAL Prune Butter. Preheat oven to 350oF. Recipe makes 12-15 muffins. Prepare muffin tins by lightly greasing with oil or vegan butter or line with paper muffin cups. 1. In a large bowl whisk together rice flour, tapioca, egg replacer, baking soda and cinnamon. 2. In a small bowl mix together flax seeds in 1/2 cup water, add vinegar, prune butter and sugar. 3. Add the wet ingredients to the dry and mix well. 4. Pour in 1 cup water and blend followed by the remaining 1/2 cup of water. Beat the batter by hand. Fold in walnuts. 5. Spoon about 1/2 cup of batter into each muffin cup. 6. Bake for 20 minutes until muffins are golden brown. 7. Remove from oven. Let cool. Remove the muffins from the tin, place in a basket and serve with your favorite spreads, like REAL Prune Butter.